With the common name of Rose Cone-flower, Isopogon formosus is a small shrub from the south of Western Australia. With a naturally upright growth habit this is a compact growing species, evergreen with deeply divided mid to deep green foliage this is an easy care plant in well drained soil. The large rosy pink flowers in spring attract bees, birds and butterflies to the garden, along with other beneficial insects. Both frost and drought tolerant, this is species that also performs well in coastal conditions. Best grown in full sun in a well drained soil, Isopogon formosus with its attractive foliage also makes a good plant for growing in containers. In containers use a free draining potting mix. In all positions use a low phosphorus native plant fertiliser. Water in well when first planting. Mulch to maintain a cool moist root run. Make sure that drainage is excellent year round and avoid heavy clay soils. The species will reach around 1 metre in height, taller in some conditions. 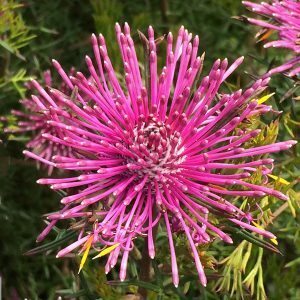 A lower growing form Isopogon formosus ‘Pink Profusion’ is well worth seeking out. This variety is said to reach around .5 metre in height.